Instead of us just telling you how good we are, we asked Birmingham-based Fiona Timba (Packed Munches) to tell us what she thinks of our cloud-based Sage One Accounts software. 1. Hi Fiona, could you please give me a brief summary of who you are, what you do and the name of your business? I spent the last four years living, working and studying abroad and realised that as an expat there are many British treats and snacks, and food in general, that can’t be purchased abroad. My best friend and I realised that there was a gap in the market for affordable food in small quantities for British expats so decided to create Packed Munches – an online subscription service that sends monthly boxes of British food to expats (and Anglophiles) across the world. There are two of us in the business – my business partner Sabrina Hamilton and myself. I have been using Sage One Accounts for two months now. Beforehand all of my receipts were (I’m ashamed to say) kept in a plastic A4 wallet! I realised that this had to change when I was trying to look at our sales figures and spending but had no idea where to start in my bag of receipts and invoices. It’s so simple to use. All I have to do is fill in the boxes and I can have a complete overview of my finances! Also the free 24 hour support is such a relief. It makes me more confident to fill out the information knowing that there are people on the other end of the phone I can call to ask the smallest of questions. It is really easy to think, “Let me just jump in and see if I can swim”, and there is something to be said for this approach but it is important to have a firm grasp on your finances from the beginning as this is what allows you to see whether or not you’re swimming or sinking. Sage One provides a really easy way of doing this that allows you to continue without being bogged down in numbers and financial details but with the ease of mind that your finances are in a good state of affairs (to be delivered to an accountant)! 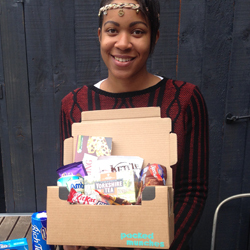 Packed Munches is a great way to send a gift box of food goodies to your loved ones abroad (or to treat yourself) so take a look at what’s available and order online at www.packedmunches.co.uk/order/. If you’re a small business in the UK and want to get your finances in order, Sage One Accounts is Sage’s online accounting solution that costs just £10 + VAT per month and includes free 24hr telephone and email support. Sign up for a free 30 day trial today!